This was a tiny bird way up in the tree and have had to crop more than half from the original image. The white-eyes are small passerine birds native to tropical, subtropical and temperate Sub-Saharan Africa, southern and eastern Asia, and Australasia. 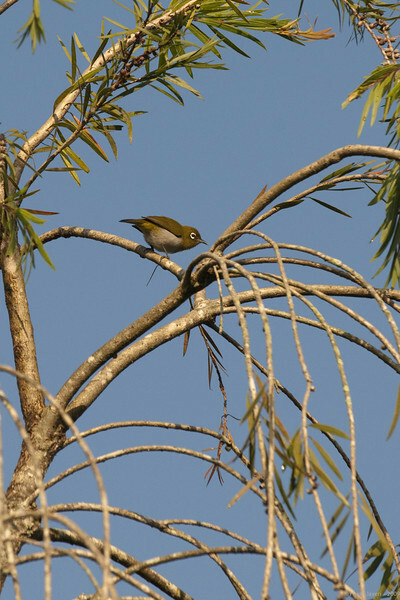 White-eyes inhabit most tropical islands in the Indian Ocean, the western Pacific Ocean, and the Gulf of Guinea. I'm really enjoying these different tome bird shots. You've really captured some amazing ones. Love the different varieties of birds that we get to see on smugmug...this guy is wonderful. What a beautiful little birdie. Lovely little bird. Great capture.